The crust on the baguette is a bit hard for dipping and eating, so we pour the jus over top of the sandwich and eat it with a knife and fork. Season roast with salt and pepper to taste. Set aside. Heat large frying pan to medium-high. Add the margarine or butter and brown the onion slices. Remove and place onion slices in the bottom of your crock pot. In hot pan, brown the roast on all sides. 3 – 5 minutes per side should do. While the roast is browning, mix together the beef broth and soy sauce. Add the garlic cloves and pepper corns. Remove roast from pan and set on top of onions in slow cooker. Pour broth mix in pan to heat and to add the flavour of the roast and onions to the broth. Pour over top of the roast in the slow cooker. Remove roast from crock pot. Let rest on your counter, covered, for 10 minutes. Slice the roast and serve with the onions and drizzled with the jus from the crock pot. Using a slotted spoon, remove onions from broth and set aside. Skim off the extra fat from the broth. To assemble sandwiches, butter your bread/baguette/bun and, if using, slather one side with horseradish. Add a slice of cheese and cover with beef. Top with a few of the onion slices. Serve with a helping of the broth for dipping or pouring over the sandwich. 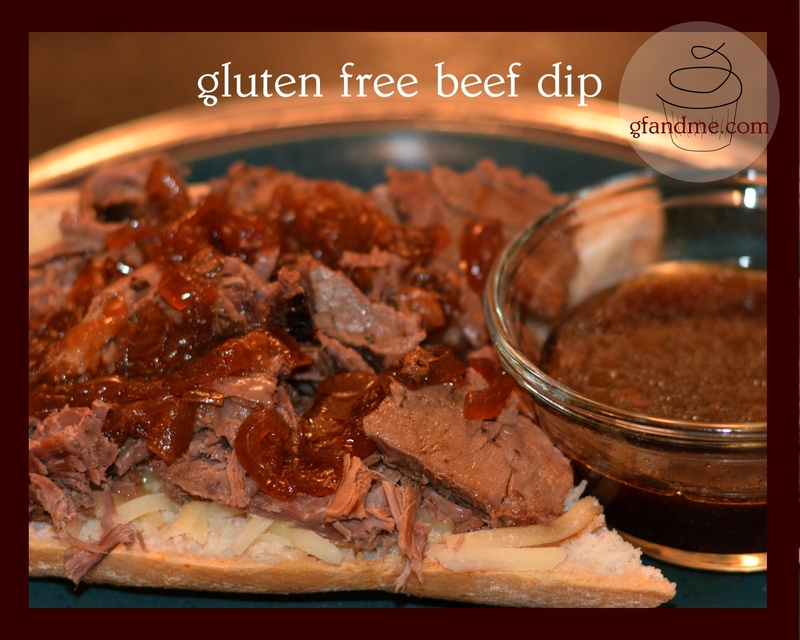 This entry was posted in Lunch and Dinner, Recipes and tagged beef, gluten free, sandwich, Slow cooker. Bookmark the permalink. Wonderful! Looks and sounds delicious! This looks absolutely delicious! And we love the crock pot for the ease of making it! Thanks for sharing….this is a definite recipe to try! That looks great. What brand of crock do you have? Even on low mine runs really hot and more times than not I end up with shredded meat instead of nice chunks like yours. Thanks Ruralroute! It’s a “CrockPot” brand slow cooker. And you know what’s funny is I have trouble making pulled pork in it. Sometimes the pork just doesn’t want to shred.